I'm so lazy that I photoshopped the dust out of this picture instead of just cleaning my desk. Controlling an in-game character using the motions of your body has been a concept I've been interested in for a long time, well before anyone even knew what a "Revolution" was. Rumors of a motion-controlled device by Microsoft had been in circulation for a little while, and the Kinect, known then as Project Natal, was officially revealed at E3 2009. I was optimistic, understanding the unique gameplay opportunities if the Kinect worked as advertised. I had already been let down by the prospects of motion control once with the Wii, and though some of that may be my fault for letting my imagination get carried away when it was first revealed, the general consensus I see is that the desired support for the Wii never really arrived. And when it comes to what I've wanted from motion control, the fidelity just wasn't there. While there are some great exclusives for the system, the Wii ended up just like my GameCube several years ago, becoming something I rarely bothered to hook up, spending most of its time in a closet or drawer collecting dust. This is in large part due to my home theater setup, in which I play everything on an HD projector which doesn't work too well with motion games (most of the 100-inch screen ends up being covered by my shadow, and the only way to set up the projector in this room is to have it directly behind the couch), and the fact that the HD monitor I use for the Kinect and PlayStation Move doesn't have a component hookup, which is an issue I plan on remedying soon. Regardless, I've never made much of an effort to fix these problems as there just isn't much I'm interested in playing. I mean, I think it's a great system, but there aren't that many exclusives I care about. I think my referring to the Wii in the past tense for most of this paragraph is pretty indicative of my experience with it. When it comes to consoles and gaming hardware, I like to own everything so I can play everything, and I knew this would be no different with the Kinect. No matter how it turned out, I knew I would be getting something out of my time with it, and I just hoped that the device would come closer to my younger fantasies of my real-life movements having an impact in a game. I headed over to Amazon on June 14th, 2010 and pre-ordered the Kinect with release-date delivery. I later pre-ordered Dance Central in October. Fast-forward to November 4th, and I'm watching a live stream of Jeff and Ryan as they play all the Kinect launch titles, checking the shipment progress of my own. Eventually, late in the afternoon, the status changes to "Delivered" and I immediately open my front door to see a small package that obviously contained Dance Central, but nothing that could hold a Kinect. "Hmm, that's odd. Maybe they're delivering it later for some reason?" They really should be commended for their work done that day. So I waited, checking outside every so often, even checking the backyard to see if they placed the package there. The Kinect never arrived. Now, I don't remember how this next part played out, whether it was customer support telling me what happened or if it was something I discovered when I went to the Amazon order page, but the reason my Kinect never showed up was because... well, because it was delivered to my old address in Texas. I had forgotten to update the shipping information after I moved to my new place in Oklahoma, and someone in my old house just got a free Kinect. Amazon is an amazing company, one that I have always loved and supported, and what they did next only solidified my loyalty. They immediately sent me another Kinect. For free. They fixed an error that was totally my fault, and even knowing the full story, didn't question whether I was trying scam them or anything. The Kinect isn't some cheap device, either, selling for $150. I actually felt bad, and the nice, helpful customer service lady seemed confused when I showed concern for what would happen to the original Kinect and whether they would get it back or not. I hope that they did. Being impatient and not wanting to wait until the 9th to get my motion-controlled gaming on, however, I went out to try to see if I could get a Kinect that night. I got the usual "only if you pre-ordered" deal at both of the GameStops I went to, so I went where I always do when they fail me and headed to Walmart, but they were sold out of anything that wasn't a console bundle. Getting desperate, I used my phone's GPS to locate any places in the area that would sell video games, and found another Walmart a few miles out in some rural area I had never been to. Maybe it being a little out-of-the-way helped my chances, as when I walked back to the electronics section to see stands where a large amount of Kinects once sat, there was still one left. "Man, this thing must be pretty popular." Victorious and reinvigorated, I headed back home to set the device up. I had heard that at least five to six feet of space was needed to use the thing, so I was a little worried about how this would all turn out. I had about that much space between my door and desk where my monitor sat, but there was this incredibly stupid step that led out of the room, taking an unnecessary foot or so of much-needed space. That foot of space was all that it took for the Kinect to not see my feet, effectively making my avatar during the calibration tests do the Kudo Tsunoda dance. I tried pushing the Kinect back and even stacking it on game cases, but there just wasn't enough space. I was going to have to reorganize my entire bedroom. And so I did, taking my desk from its place against the wall and putting it in the very middle of the room, sacrificing aesthetics for usability. I now had plenty of room, and the Kinect worked marvelously. I did what many people do when they celebrate and started dancing, except I had the benefit of owning a video game which focuses on just that. And you know, I must say... there's something really special about unlocking achievements using your whole body. The 9th came around and the original Kinect arrived, which I ended up selling on eBay for a nice profit. Since then, I've beaten Kinect Adventures (pics and video coming soon!) and received Your Shape Fitness Evolved as a gift. 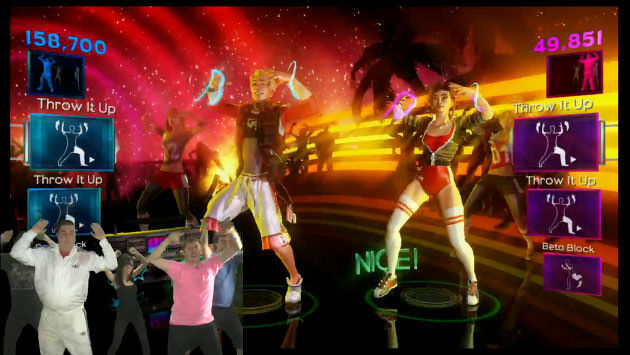 I plan on beating Dance Central and getting as many achievements as possible in Your Shape before their sequels come out later this year. I also intend to play Child of Eden, Fruit Ninja Kinect, Rise of Nightmares, and The Gunstringer relatively soon. So far, I've gotten good use out of the Kinect, with the only annoying issue about it is having to move my 360 back and forth between my office and the living room, but that's just me being lazy. It's about to get used a lot more as I try to overcome my heart condition that I've had since the age of 16, hoping that the unpleasant ordeal it's sure to be will be masked by the fact that I'm playing a video game and unlocking achievements. But that's a blog post for another time.